Each year, 10 million Americans seek help from their physicians for sleep disorders. These disorders may be triggered by stress or may be the result of a lifetime of sleep difficulties. Among the patients I see, one of the most prevalent disorders is obstructive sleep apnea (OSA). According to the American Academy of Sleep Medicine, OSA affects between two and four percent of the adult population in America. When left untreated, OSA can lead to devastating effects on heart and brain health, impaired quality of life, and increased motor vehicle and workplace accidents. OSA occurs when the airway collapses during sleep and blocks the flow of oxygen to the brain. The brain senses a lack of oxygen and wakes the body up just long enough to take a breath, then falls back asleep. This cycle repeats throughout the night and causes poor, disruptive sleep. For many patients struggling with moderate to severe apnea, a commonly prescribed treatment is continuous positive airway pressure (CPAP) therapy. A CPAP machine uses a hose and mask interface to deliver constant and steady air pressure while the patient sleeps. However, some patients have difficulty acclimating to CPAP therapy, or cannot tolerate anything on their faces while sleeping. As a result, compliance is often poor and associated with serious health consequences. Historically, for those patients with cases of moderate to severe apnea where CPAP therapy was ineffective, surgery would then be considered. With surgery, some patients often require more than one procedure, which can be invasive and permanently change their anatomy. A new therapy has recently emerged that works inside the body to help restore the patient’s natural breathing process. The Inspire Upper Airway Stimulation Therapy uses mild electrical stimulation to branches of the hypoglossal nerve to keep the airway open during sleep, allowing air to flow naturally. The device is implanted during a minimally invasive outpatient procedure, and the patient uses a small handheld remote to turn the device on before bed and off when they wake up. Most patients return home the same day as the procedure and take over-the-counter pain medications, as needed, during their recovery. 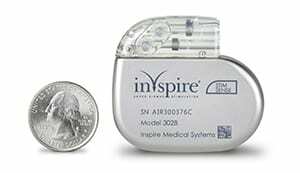 Inspire is safe, portable, does not require any ongoing upkeep, and the procedure is reversible. Inspire therapy is intended for patients who are diagnosed with moderate to severe OSA; are unable to use or get benefit from CPAP; are not obese; and are 22 years of age or older. Early results are extremely promising and patients report feeling comfortable and better rested with this therapy. It is estimated more than 3,500 patients worldwide have been implanted to date and published reports support the long-term benefit and satisfaction with this treatment. My colleague, Jessica Riccio, MD, and I at Albany ENT and Allergy Services are excited to be the first in the Capital Region to provide Inspire therapy. St. Peter’s Sleep Center is accredited by the American Academy of Sleep Medicine, staffed by board-certified sleep specialists, and provides a comprehensive range of services for sleep disorders. 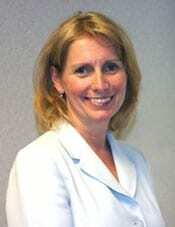 For more information on sleep apnea and treatment options, including Inspire, please call the center at 518-464-9999.